All scrobbles or just play summary? 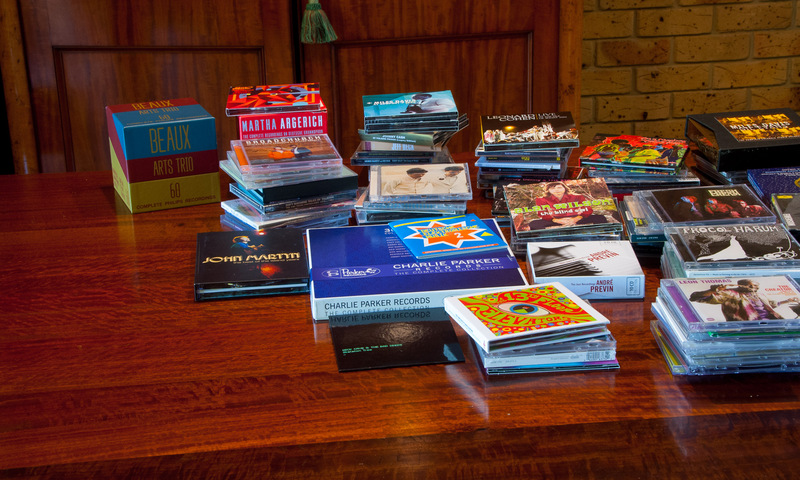 Want your whole music collection available when travelling? How safe is your scrobble history? Which household members need to be enrolled into AlbumPlays? The install wizard (described here), will have created and enrolled an initial Listener into your database. The simplest way to enrol a new Listener is to use the Edit|Listeners menu option, then press the New button as shown below. Then supply an ID for the new Listener. A Listener ID can be anything (first name, initials, LFM account name, etc). It must not have any embedded blanks. There is an alternative option, for people using SPY mode, which may help ensure that identical Listener IDs are used across both modules. 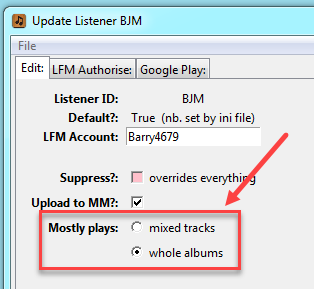 An alternate option to configure the Listeners into the Observe & Detect configuration file first, and then copy the updated _lfm_id_list option line into the [general section] of the configuration file for the Play Count module. When you next start the Playcounts component it will detect any new IDs in the list, and offer to auto-enrol them. 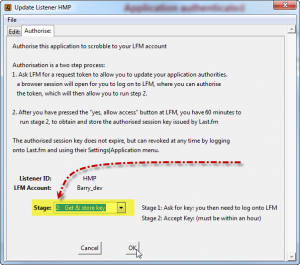 This method will ensure that you have used identical Listener IDs in each module. 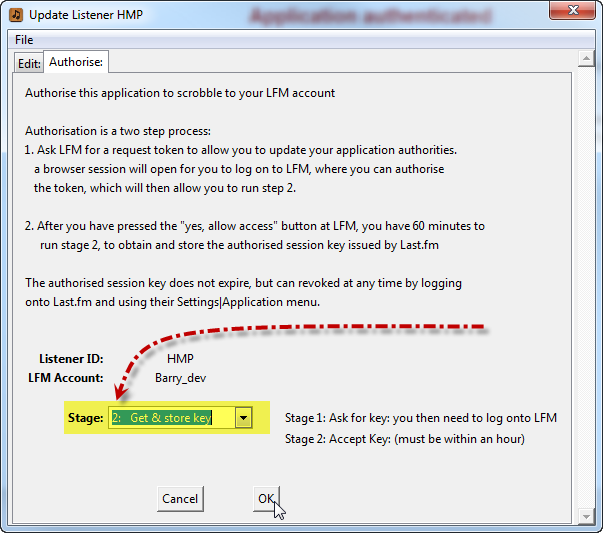 As an illustration I have added Listeners “HMP” and “others” to the _lfm_id_list configuration line. As with the first option, the new Listeners will need to be fleshed out as described in the modifying Listeners section. 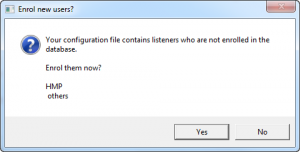 The install wizard (described here) will have configured your initial listener. You can add more via the “Configuration (MySpy.ini shortcut). 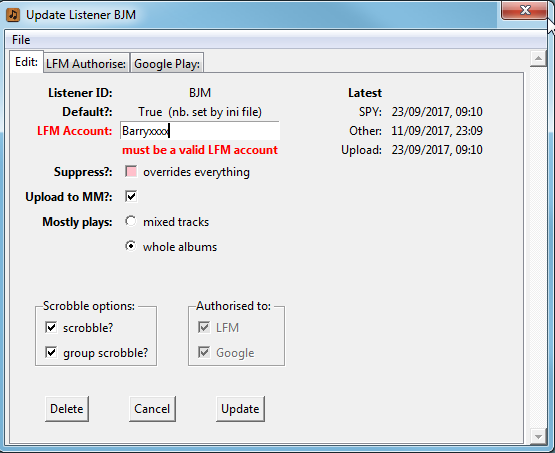 To do so, add the new Listener ID(s) to the _lfm_id_list option as described here. Also review the other listener related options which are discussed there. Use the Edit|Listeners menu option. You can modify the last two columns (“To MM” and global Suppression) directly in the above list, and then press F3 to apply. 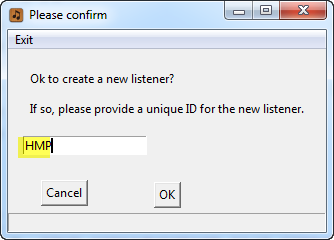 For other updates press the Listener’s “?” button to access the main Listener Update facility. 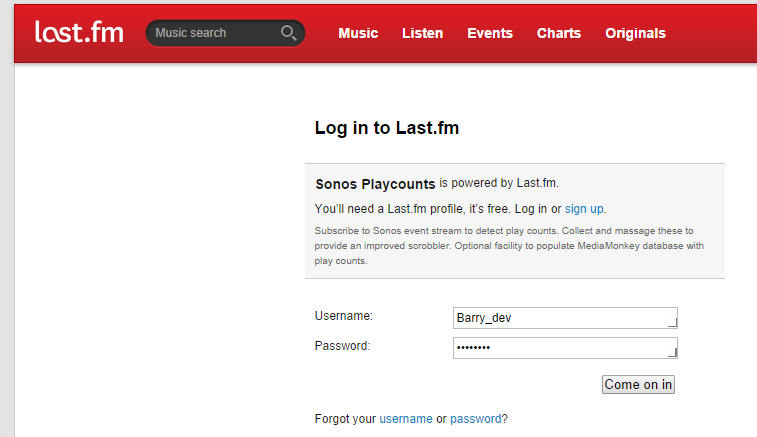 Here is where you can change the Listener’s Last.fm account name. If you make a change, then screen validates your entry to ensure that you have supplied the name of an active Last.fm account. You don’t need to supply the account password. Mostly listens to: whole albums or mixed tracks? Which type of listener are you? Use this control to indicate what you usually listen to. By default AlbumPlays does not scrobble. It imports scrobbles, but by default does not generate scrobbles. Scrobbling is an option, but the option needs to be turned on. See here for an overview of the benefits of my scrobbler. 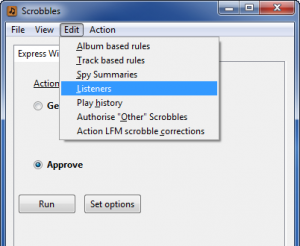 See here for a Quick Start guide showing how to configure AlbumPlays for scrobbling. You should read the Quick Start guide now. 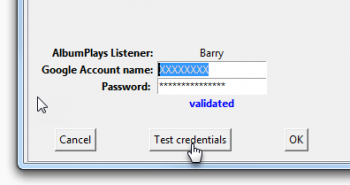 A Listener ID can be anything (first name, initials, LFM account name, etc). It must not have any embedded blanks, and it must be referred to identically (including upper or lower case characters) in the both the “Observe & Detect” and the “Play Count Processing” modules. See here for a discussion of the limitations of the multi-listener facilities in this application. Spy mode is implemented as two separate components. Your new Listener needs to be added into both halves. You need to make sure that your new Listener(s) are identified by exactly the same Listener ID, in both halves of the application, including identical usage of upper or lower case characters. This scrobbling mode is now mostly outmoded by the “group scrobbling” option described above. All Listeners who wish to have scrobbles accumulated, whether they are to be held in suspense or not, need to have their “Scrobbles?” column checked (see the “Modifying Listeners” section above), and they need to have completed the authorisation step covered in the next section. Read the Scrobbling Quick Start Guide for an overview of steps required to configure AlbumPlays for scrobbling. Zones assignments are done via the configuration file of the Observe & Detect component. This application does not need your Last.fm password, but it does need you to advise Last.fm that you agree to allow this application to scrobble to your Last.fm account. You do this by accessing the Listeners’ maintenance list as described in the “Modifying Listeners” section above (menu item Edit|Listeners). Press the “?” button for the Listener whose Last.fm account that you want to scrobble to. 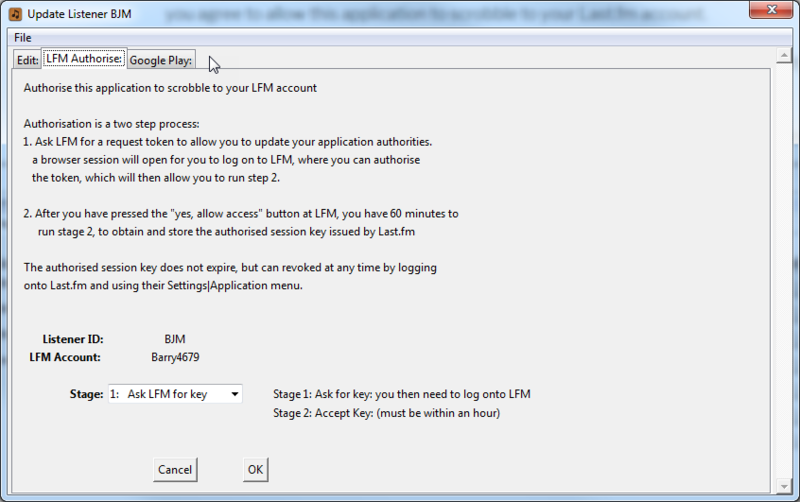 Select the “Authorise” tab, as shown below. 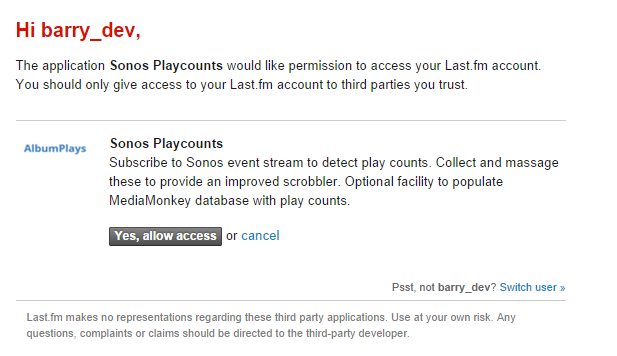 Last.fm asks you to confirm that you are granting permission for this application to scrobble. 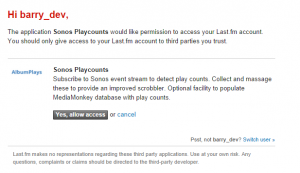 Last.fm recieves your request, and prepares an authorisation code for AlbumPlays. It is important to note that AlbumPlays is still not authorised to scrobble to your account at this point. 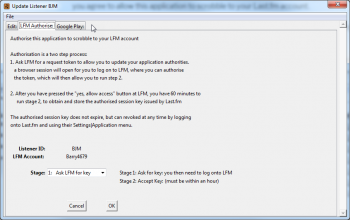 You need to complete the following step which will cause AlbumPlays to obtain and store the authorisation code. The application will now be authorised to scrobble to your account on an ongoing basis. 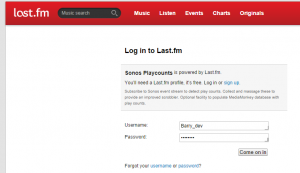 Open a browser session, and log into Last.fm. 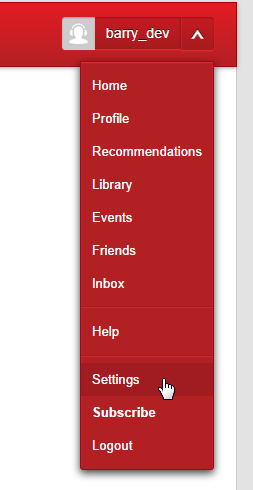 Select your profile’s Settings menu item. Press the “Remove” button to revoke permission for this application to update your Last.fm account. AlbumPlays offers some integration with a Google Play Music library. Press the “?” button for the Listener who owns the Google Play library. Select the “Google Play” tab, as shown below, and the follow the instructions. Press the Test credentials button. 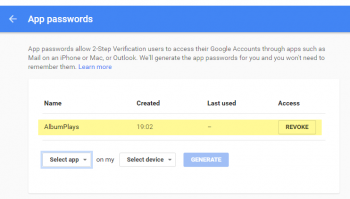 AlbumPlays will validate your credentials against the Google account. Then press OK. … AlbumPlays will ask for an encryption phrase so that it can store your credentials safely into the AlbumPlays database. The encryption phrase is never stored. You need to re-supply it each time you publish a playlist to your Google Play Music library. .. 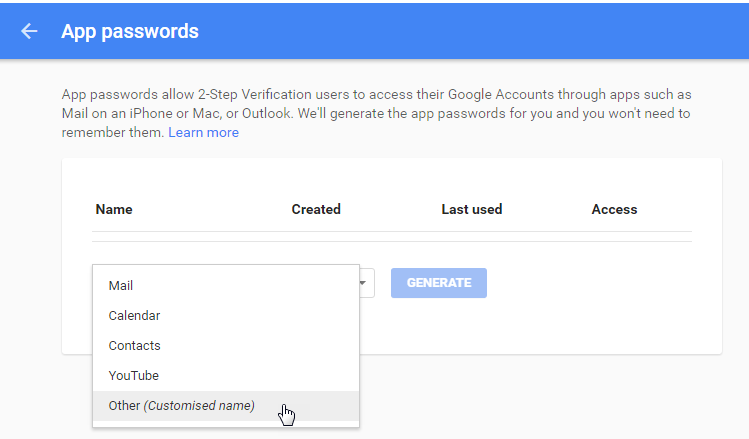 The intention is that the phrase be something easier to type and remember, than your proper Google password, as you will need to enter it often. … nb: “easier to type and remember” of course means that it will is less secure. But the phrase is never sent across the Internet. It is just used encrypt and decrypt, locally, the stored copy of your password, as precaution should your computer be stolen or accessed by intruders. 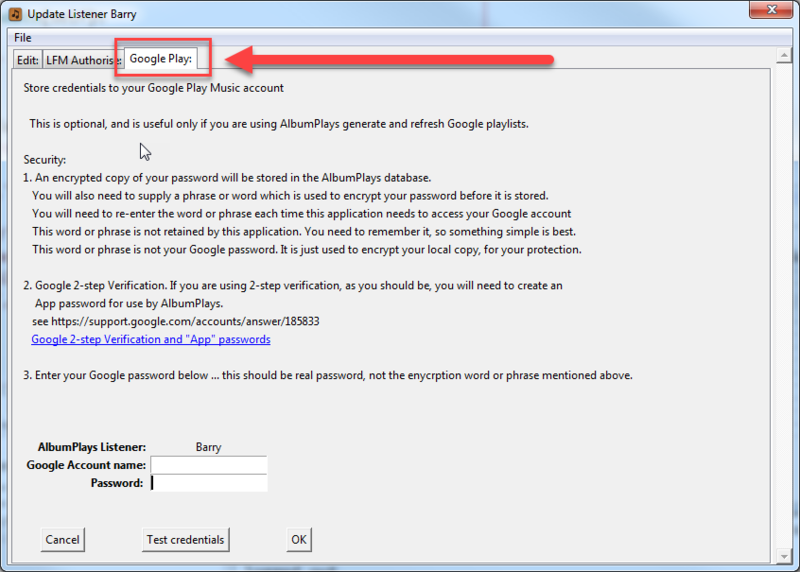 If you are using Google’s two-factor authentication, you do not provide AlbumPlays with your main Google password. 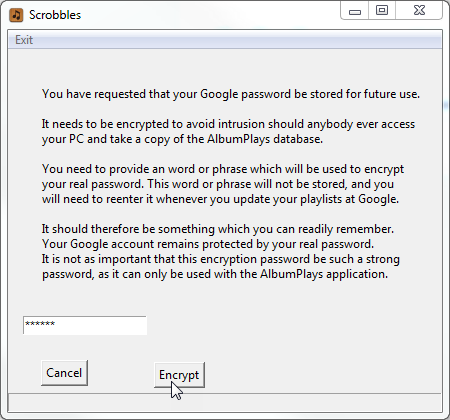 You need to ask Google to generate an application password for AlbumPlays. 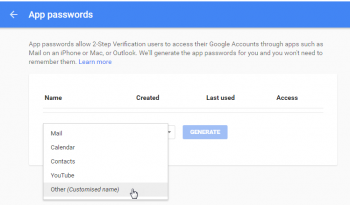 Use the above link to generate an application password. 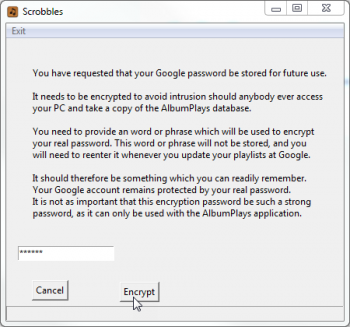 Enter “AlbumPlays” as the custom application name, and specify that the application password is for use on your desktop computer, then press Generate. 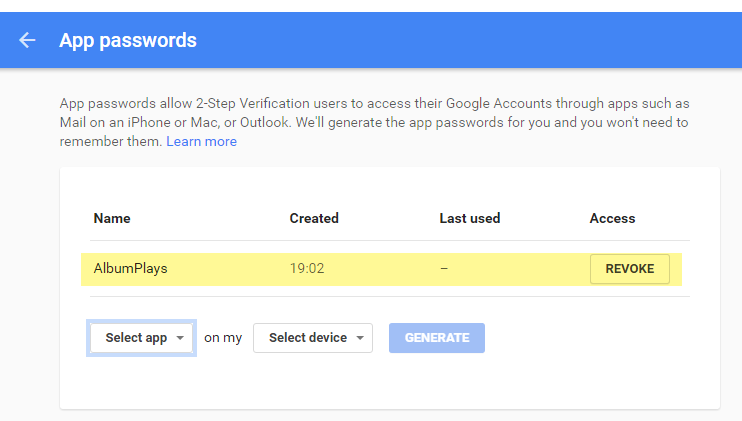 Google will generate a password for use by AlbumPlays. The password is large random string of characters. It is issued by Google once-only, and is just intended just for the one application (AlbumPlays). 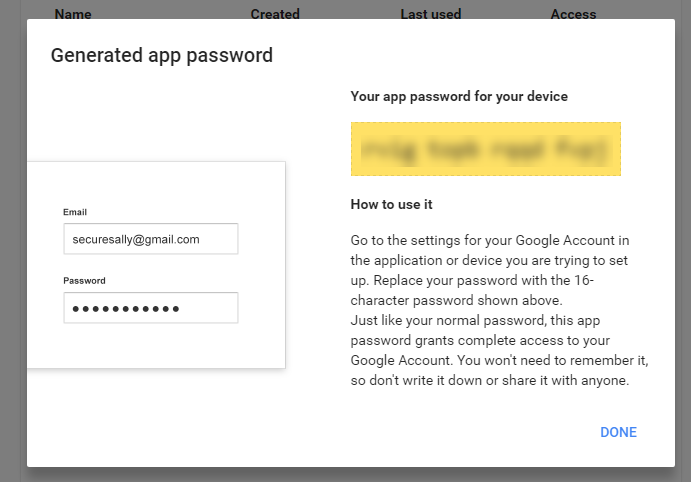 There is no Google password display facility to view the password again later. The intention is that you copy and paste it immediately into your application, and then forget it. 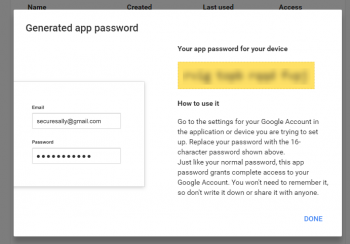 It cannot be used to log into your Google account via a browser. These limitations are an intentional part of the security design. 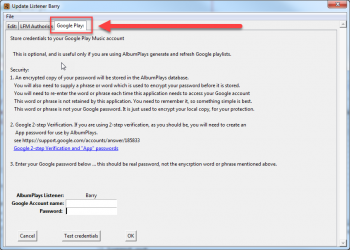 Copy and paste the password into AlbumPlays as described above, where it will be encrypted, and stored for use whenever you publish or refresh playlists to your Google Play Music library. This is a hobby site. Commentary and software is offered free, without guarantee nor warranty. I use these tools on my equipment, and believe them to be fit for use. If you strike a problem please contact me. I am a customer of the companies mentioned here, but otherwise have no connection to any of them.